Ha ha. I thought I’d get around to collecting my thoughts about the summer in Germany and blog about it, but look, it’s already time for another recap on running. I’m consistently getting closer to regular 6 miles. I haven’t done more than an eight mile run in over five months, but I’m getting closer to the point where I’ll try an 8-10 miler (maybe even next weekend?!). These past three weeks I’ve averaged around 20 miles as well and run more days in a row. I obviously didn’t run on the day I flew back to the US, but I ran the four days after that and kept the runs shorter and comfortable (I was woefully reminded of what running in sub-tropic climates in the summer feels like). I managed to get a cold (probably from sitting around too long in air-conditioning in sweaty clothes). Still, I felt ready for an interval session on Friday, so after rearing myself in after a fast warm-up mile, went for 3 x 800s with .2 mile recoveries. The humidity of South Florida is not to be underestimated, though. I found the 3 were enough and couldn’t get under 3:16. But it’s a good baseline for September running in Florida and training in these conditions will prepare me for the cooler, drier fall in Berlin when I head back. Hope everyone is running/recovering well and that Harvey doesn’t leave too large a trail of destruction. Stay safe! To race or not to race… Hey! I can’t decide if I want to race next weekend (not this weekend, but the first of the month). But before I get into whether or not I should do it, let’s back-track a bit to the days where I raced every week and sometimes twice a week: high school cross country. During high school, all the self-discipline I needed was to change into my running clothes (consisting of a cotton t-shirt and soccer shorts… I didn’t get fancy [or smart/cotton in Florida?] until college) and make it over to the cross country coach’s classroom. There were coolers with water and Gatorade, a group of running buddies, and a coach with a plan waiting for me. Now, I have to organize the times I run, the workouts I run, and I am almost always solo unless my brother deigns to join me. During high school, I also got to run races for free. I didn’t have to worry about the funds to pay registration fees or figure out ways to get to the races and pay for said gas. I had it made, as a runner. Now, on my TA funds (most of which go towards fueling myself for running), I find it hard to regularly sign up for a race. Also, I have other things to worry about, like priorities. I had priorities in high school too, like getting good grades, hanging out with friends, having a boyfriend, but I also had a set amount of time to train every day and I needed surprisingly little sleep (though, based on my later results, that’s probably not true). Now, my academic and social responsibilities require more work and more time. My responsibilities to my family are especially increased, and I am less likely to pop-off on a weekend morning to disappear for hours at a time. So, I am less likely to sign-up for a race because I feel that I am less likely to train for one or make it to the race. Take the last race for example, the Berlin City-Nacht 10K; I had to miss it… two months training out the window. Therefore, in light of all the obstacles, I don’t know whether I should register for the race in question that’s coming up. Some factors that come into the decision are the fact that I’ve had a nagging plantar fasciitis issue and that I am preparing for MA exams that make it more likely for me to blow off a training run (like the one I’m avoiding for today). I also don’t know if I’m prepared for this run. 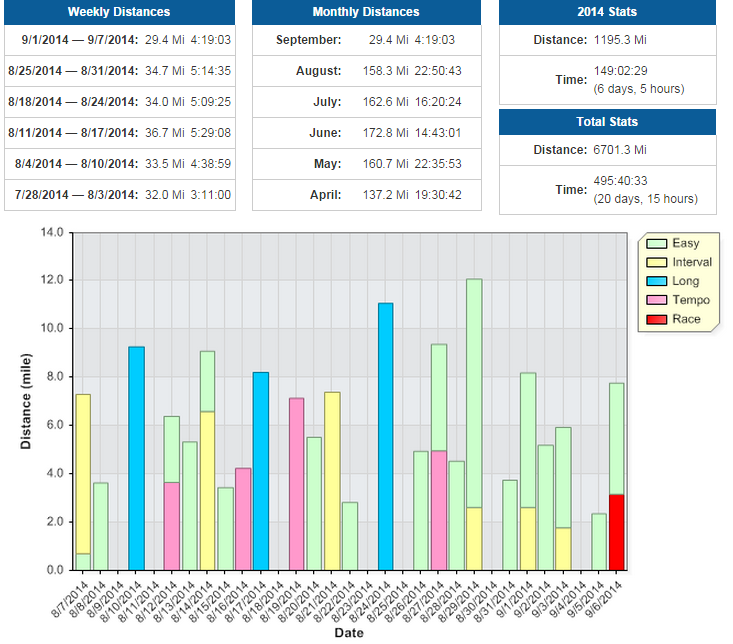 I have about four weeks of 30+ mileage weeks and the starts of cross country training. But I also haven’t been running very fast, and I won’t be able to train this weekend properly. But now comes the fun part. What do you all think? I have 25 dollars that may or may not go towards the peanut butter fund. Today, I am going to guest post from my other site, the wanderwolfreading one, and then add a few thoughts about the purely runner aspects of it. As always, I’m afraid to ask too much of my readers who are not interested in running. You can read my mostly non-runner thoughts on John L. Parker, Jr.’s Once a Runner here. 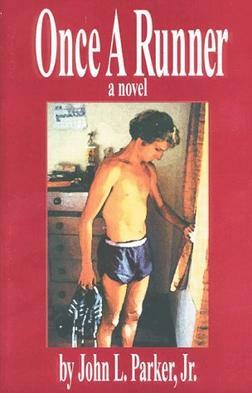 This is the original 1978 cover of the novel. It’s a lot like I looked as a collegiate runner, obviously. The room, shoes, and shorts, at least, look familiar. I encourage readers to judge for themselves and to take a look at this book. I bought Once a Runner for less than five dollars on Amazon, and it is a book I don’t mind keeping on my shelf for a very long time. However, one matter that disturbed me was how Parker, Jr. distinguished his “runners” from a large population that considers themselves runners. Often, Parker, Jr. refers to them as joggers, or “plump, determined-looking women slogging along while fleshy knees quivered.” On the one hand, Quenton Cassidy (the main character) considers himself and other collegiate runners as a league of their own. On the other hand, he does things and thinks in ways that many other people do who are not of the same physical caliber, but of the same heart. But perhaps that is the distinction Parker, Jr. wants to make. There is a difference between a collegiate runner who runs as a side-project on the way to getting his or her degree, and someone who is hungry for a record, someone who wants to be the very best (cue in Pokemon). Seriously, I think it is powerful the way Parker, Jr. examines the curse of the runner in the world of accomplished people, that is that the runner competes not only against those that are existing at his or her race or during his or her time, but that s/he must fight against black on white that exists throughout the ages and is brutally budging. I see myself falling into the trap of being satisfied with winning races and beating the soccer mothers or skinny-obsessed women at road races, but part of me still yearns for the run that will be my best yet, where my 21:15 5K becomes sub-21, or even sub-20. I fight against anything that takes me away from fully focusing on my training, but at the same time, I am not fully committed to giving everything up for my dream. I admire the way Cassidy drops out of school to train intensely for his dream, but he was also much more talented to begin with. So, I guess what I am trying to write is that while I admire Cassidy and I think the story is great, the novel good, I also think it is a bit uncomfortable for someone who is almost a runner to read Once a Runner. It makes me doubt myself as a runner. While I am in many ways like Cassidy, I too obey the Calendar God, see training as the butter of my competitive nature, need the friendly competitive camaraderie of a team to feel happy as trained by four years of high school running and one semester of collegiate (long story-short: went to 4-year non-NCAA college, had only one year of competition eligibility left when going to grad-school, couldn’t handle cross country, MA studies, AND being a graduate teaching assistant who actually taught two classes…), I don’t compete at his level. His life is my day-dream and motivation to run sometimes, but I won’t ever be at that level… be it lack of talent, lack of full commitment, whatever. At the same time… I am forced to wonder if I could be at his level if I tried hard enough, ran enough miles, but I may be hopelessly hoping. My thoughts. Hope you enjoyed them and that if you haven’t read the book yet, you do so! It was humid, warm, and generally ugh. But I did it because otherwise I would find it harder and harder to get back into running here. I found the low elevation and lack of hills made running easier, but the run was still difficult because it felt like I was gulping in water with every breath. At least I benefited from jet lag that made running at 6 AM feel like min-afternoon. Workout: 2 X 9 minutes at tempo pace with 2 minute rests. I completed a twenty minute warm-up and an 18 minute cool down. Tempo pace for me lies around 7:30 minutes per mile (mpm), but somehow I thought I wanted to do 7 mpm, so I ended up going between 6:45 and 7:25 mpm. There was some walking in between and rests. All told, 6.98 miles at 59 minutes of running. 2 pounds of sweat loss. Oh how I enjoyed my shower after breakfast.